It's easy to dismiss the people that you meet online as less important than those you see in real life. The contact that you have with them is fast and usually anonymous, and most encounters end as soon as the timer runs out. But that doesn't mean that all relationships online are so meaningless. To some internet denizens, especially those who frequent virtual worlds such as Second Life, the people that they meet online are just as important to them, if not more, than those they see in meat-space. I didn't always recognize that fact. With the help of two vampires named K and W, I discovered just what these virtual world and the relationships forged there can mean to the people who actually play them. When I originally heard about Second Life, I thought it was absolutely ridiculous. A couple of friends introduced me to the idea of living vicariously through online avatars, and, after a little research, I was amazed to see the impact these virtual lives had on real-life profit margins. I declared Second Life a giant rip-off and dismissed it as a waste of both time and money. My friend suggested that before I judge, I might experience it myself. I agreed that it wasn't fair for me to judge based purely on humorous Wikipedia comments, so out of morbid curiosity, I created an account. 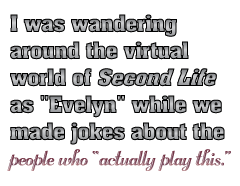 Ten minutes later, I was wandering around the virtual world of Second Life as "Evelyn" while we made jokes about the people who "actually play this." I was bombarded with advertisements for things that most nice girls don't even think about. But there in Second Life, for just 100 Linden Dollars, I could have a perfect set of ... assets. And then some. After five minutes of wide-eyed embarrassment, I logged out and swore that I would never return. I resumed cracking jokes about the people who "actually play this." That night, my insomnia got the best of me yet again and I was bored. The Second Life confirmation email winked at me from my inbox, daring me to find a better way of spending the late night hours. I acquiesced and logged in again, this time determined to figure out the allure of this virtual world. I spent ten minutes wandering from place to place, trying to understand what exactly was going on. Everywhere I looked, people were milling around, interacting and buying stuff from stores that all looked the same to me. It was in one of these giant stores that I was approached by two characters who greeted me warmly and welcomed me to Second Life. "W" introduced himself first. His avatar was a tall, lean gentleman decked out handsomely in the latest Edwardian fashions, complete with frock coat and black lace cuffs. The second was "K," whose female avatar was scantily clad in a daring black and pink ensemble that ended in a pair of 5-inch heels. K and W both had microphones so they used voice-chat to speak with me directly, while I tried to keep up by typing text. It made communication slow, but not impossible, and at times I felt like I was typing to the omnipotent voice of God whenever W's booming laugh would reverberate through my speakers. K was more soft-spoken, but her confidence and authority grew when she saw that I was interested in what she had to offer.